Is Zambia's Media Under Attack? Is There Lack of Institutions Hampering the Fight Against Corruption? Remember When Lungu Said He's Learning a Lot from Mugabe? Citizens Firmly Defend Democracy, Will They Stand Up Against Lungu? 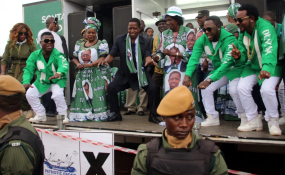 President Edgar Lungu and his party supporters (file photo).